Hailey Kendrick always does exactly what’s expected of her. She has the right friends, dates the perfect boy, gets good grades, and follows all the rules. But one night, Hailey risks everything by breaking a very big rule in a very public way…and with a very unexpected partner in crime. Hailey gets caught, but her accomplice does not, and Hailey takes the fall for both of them. 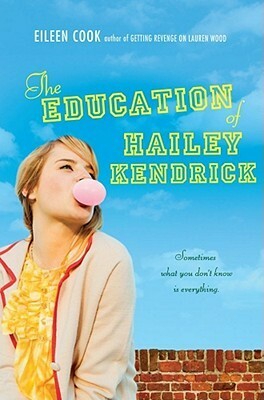 Suddenly, Hailey’s perfect life–and her reputation–are blowing up in her face. Her friends are all avoiding her. Her teachers don’t trust her. Her boyfriend won’t even speak to her for long enough to tell her that she’s been dumped. They say honesty is the best policy–but some secrets are worth keeping, no matter the cost. Or are they? I am so intrigued with stories where the main character seems perfect and has to deal with the fact that they aren’t. I didn’t like it as much as I thought, but it was still an interesting read. I can definitely relate to Hailey wanting to be perfect, and to the moment where she does something she wouldn’t normally do. I really liked the relationship she formed with Drew because of that one moment, and how she started to show and figure out who she really was instead of projecting a particular image of herself because that’s what people expected of her. I get why she did it, and I can understand why she’d take the fall for a friend. But that was one of my least favorite parts of the book. She takes the fall, (understandably) doesn’t want him to say anything because he’ll probably lose his scholarship, and is ostracized by the entire school because the punishment extends to them. He never says anything, and is assigned to keep an eye on her or whatever. Which is all kinds of weird because he’s partly the reason why she’s in this situation in the first place. Not only that, but the entire school not being able to leave campus because it will make her reveal who her partner in crime was. I can sort of understand it, but at the same time, she’s determined to not say who it was, so it also seems a little pointless. There are also some really weird things about the book. Like, the entire school has restrictions, but she ditches school. While also being someone who was previously set up as someone who doesn’t break rules. She’s weirdly sheltered, and has never heard of Denny’s, even though one is down the street. I wish there was a little more to it- it does seem like a pretty shallow look at a girl who’s learning to not blindly follow the rules and to make her own way in life. And that’s not necessarily a bad thing, a light, fun look at something like this. I think I just expected something a little more. 3 stars. I liked it, and I could relate to Hailey a lot, but at the same time, I wish it had a little more to it.